Poplar in March was exciting to say the least. It was a big event. They were running CIC1 and CIC2 divisions plus everything from beginner novice through advanced. There were tent stables and trailer tucked in every which way! Friday was a pretty good day. There was a lot going on. Lots of energy and atmosphere. Everyone's dressage is steadily improving. Aly kept a lid on it in the arena which is progress, especially since she came unglued on the hack to Poplar's upper most dressage arena. Heidi (Calysta MWF owned by Meredith Michelfelder) put in a solid and consistent test with some hints at brilliance. And the baby horses are starting to get the drill. Everyone jumped well on Saturday. James (Professor Moriarty owned by Sarah Sage) ate up his first training level XC course; he's got so much jump and an enormous gallop. Aly show jumped well after a complete melt down in the warm up. It's never encouraging when your horse runs backwards with you away from the fence, but Betsy did a phenomenal job getting her back on the job in the arena! Warren had a green stop at the B element of fence 6 on XC. It was a big skinny wedge and the first proper training sized fence on course; it caught Warren and Jessie a little off guard. It was unfortunate, but he came around the next time and jumped it great and went on to cruise around the rest of the hard stuff no problem including an imposing coffin, a bright log into water which caught a lot of people out, and a bank complex. 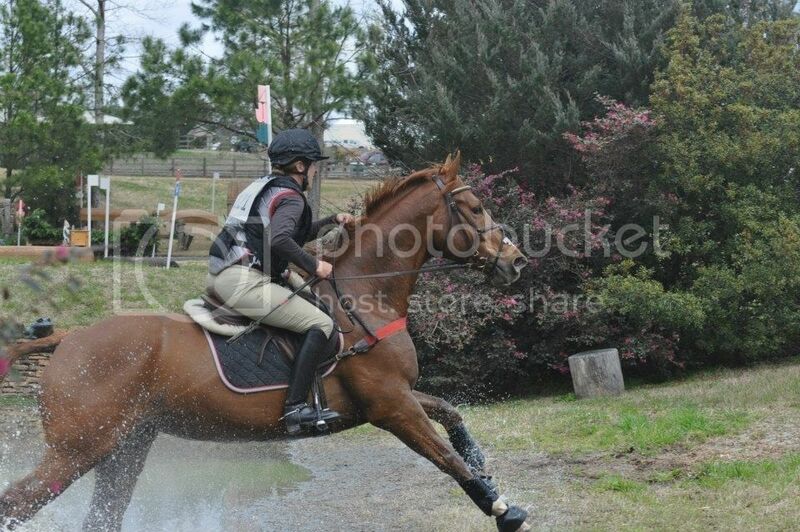 The highlight of Saturday and arguably the whole show was Heidi's XC round. Heidi came galloping down to the fourth fence on course, the big steeple chase brush fence. She got right to the base before she realized how big the brush was on the other side and propped hard left over it. She landed in the brush on the far side, which pulled Jessie's stirrup right off the bars of the saddle. It was a true "over, under, or through" moment. And did they pull up? No way. Jessie and Heidi rocked around 16 more fences with one stirrup. And this course had everything: corner combination, busy waters, angled tables, skinnies, and even a serious coffin. They made it around without jump penalties and only 12 time penalties. It was epic. Channeling the inner Mark Todd! After the excitement of Saturday, Sunday was a bit of a let down, especially because it rained hard all night long. Everyone's SJ was improved! 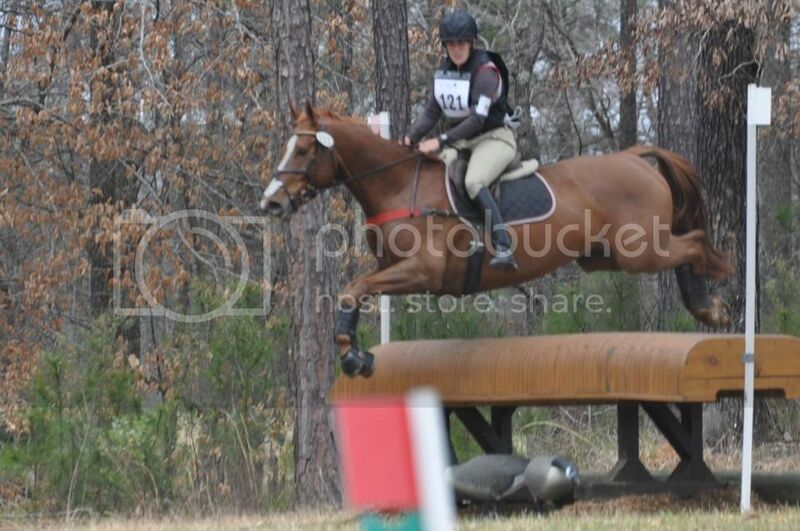 We still had some rails, but all the horses were more ridable and jumping better than earlier events this season. 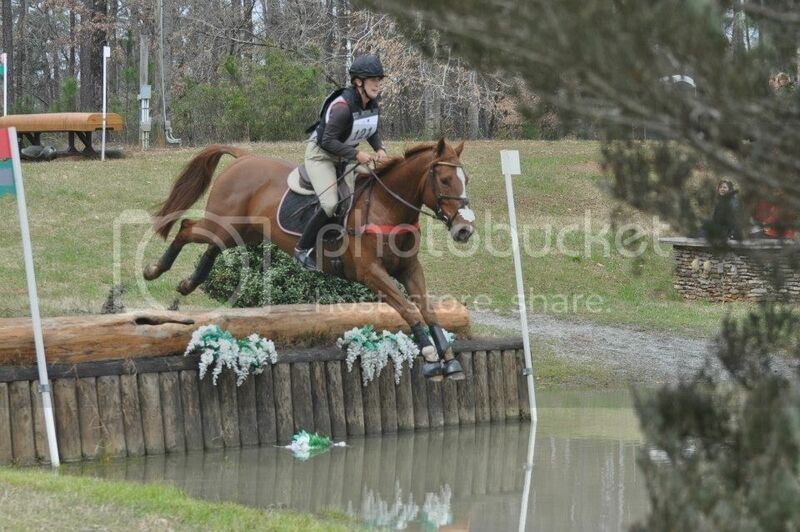 Betsy decided to retire Aly at fence two on course after she was slipping a sliding in the mud. It was the right decisions especially considering Aly wasn't drilled and tapped. Better to walk home with a sound horse and rider than try to be a hero! She'll have another shot in a couple weeks. Thanks to everyone who came, supported, and helped! Now we're home and doing some homework before Chatt Hills in a couple weeks!